AC Propulsion, a global leader in electric drive design, development and manufacturing, announced today that the Yokohama-sponsored electric race car using AC Propulsion’s proprietary electric drive system broke it’s own record set last year at the 88th annual Pikes Peak International Hill Climb. 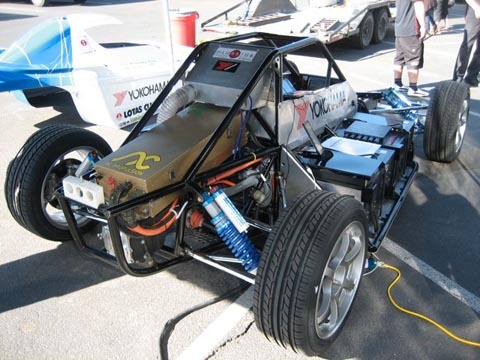 The electronic race car won the hill climb’s Exhibition Class and set a new EV record, coming in at 12:20:084, beating last year’s 13:17:575 record. The car was also the race’s fastest EV among both cars and motorcycles. This year’s 89th annual Pikes Peak International Hill Climb is comprised of racing to the 4,301-meter summit, covering 12.4-miles. Road conditions vary based on rapidly changing temperatiures and weather as well as combination of tarmac/ gravel surfaces and 156 turns. The Yokohama EV is a rear-wheel drive, open-wheel race car . The AC-180 motor cranks out 268-hp at 6000-7000 rpm and has 258 lb-ft of torque.